It seems Italy's latest and greatest export these days, besides mozzarella and the Pope, is a slew of homegrown melodic hard rock bands in the sleaze, glam and punk tradition. Of course, this is not new. Scandinavia has had a renaissance of sorts going on for nearly ten years, and you're beginning to see more in the United States too. Additionally, it's the upstart Italian label Street Symphonies that seems to have a knack for discovering some of those better bands both locally and now, internationally. This summer the label gives us Upper Class Bastards from Italy and Peep Show from Scotland (reviewed here). 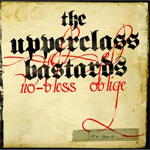 Upper Class Bastards, formed in 2005 by lead vocalist Charlotte S, leans more to the traditional rock 'n roll side dealing more melody and hooks with a punkish vein and less of the sleaze or glam. Charlotte's vocals fit well with the sound having enough grit to rock, but sometimes not enough power rise above the music. Yet, the music is the real gem here. No-bless Oblige is not simply warmed over Sunset Boulevard brashness and predictability. Every song has redeeming merits coming mostly from diverse compositions that offer punk nastiness (Trip or Burnout), pure catchy rockers (Slash, Idol of Myself), and heavier bits with fast tempos (Out of Time Hero). Some songs simply throw unexpected curves like the bouncy, almost rockabilly, Bang Bang, or the atypical, but solid and traditional melodic rocker, Excuse My French. Besides the fine arrangements, the other star is guitarist Dario Orlando who has a well-developed style that, like the compositions, transcends your basic rock guitar solo. Italy's Upper Class Bastards and their debut disc No-bless Oblige is another great find of diverse and well-crafted rock 'n' roll from the 'little label that could,' Street Symphonies. The solid and creative arrangements transcend typical conventions demonstrating UCB's potential and promise. Recommended! Italy's Upper Class Bastards and their debut disc No-bless Oblige is another great find of diverse and well-crafted rock 'n' roll from the 'little label that could,' Street Symphonies. The solid and creative arrangements transcend typical conventions demonstrating UCB's potential and promise.